Is Managed WordPress Hosting Really Worth the Cost? Premium features, however, come with a premium price tag. They’re often double the price of basic shared hosting packages or more. For example, DreamHost’s shared hosting is only $8.95 a month, while their managed hosting plan is $19.95 a month (their dedicated service, by contrast, starts at $149 per month). The cost of a managed WordPress site can add up to hundreds, even thousands of dollars per year. So, is opting for managed WordPress hosting really worth the cost? In this article, we’ve weighed up the pros and cons of the various options and gone over the most popular features on offer to help you decide if it’s worth it. How Deep is the Need for Speed? Improved speed is one of managed hosts’ biggest selling points. The biggest attraction, by far, of managed hosting is the promise of increased speed. Hosts offer dedicated servers for your WordPress website which means it won’t be sharing resources with other customers. They also claim that with their advanced features (including security tools, custom installation, and plugins) the performance of your WordPress site will always be optimized. But with all this talk of speed, it’s easy to avoid the question of whether users actually need it. If your shared WordPress site is already pretty fast, how much more speed do you need? What is fast enough? In an age of improved bandwidth and LTE mobile connections, most websites enjoy fast loading times. Then there are also the standard steps a WordPress site owner can take to improve performance such as caching static site files, limiting plugins, and making regular updates to WordPress. The major difference in speed comes when comparing shared to dedicated servers. In independent testing (from codeinwp and WP Site Care) the average loading times for a shared WordPress page were between 700 milliseconds to 1.5 seconds. A study by ReviewSignal found that for managed WordPress hosting, the average loading times were between 300 milliseconds to 1.3 seconds. 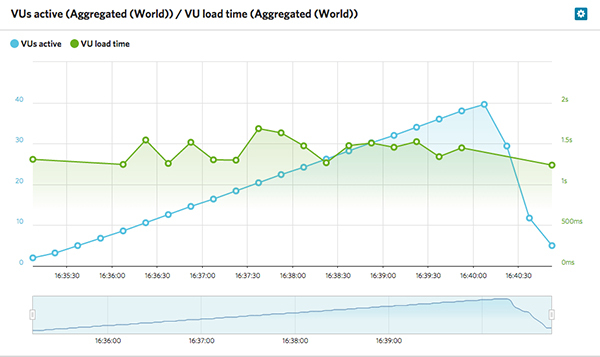 Example of load times of shared hosting site. Courtesy of WP Site Care. The differences here are almost razor thin. Our general feeling is, if you’re interested in speed alone, managed WordPress hosting may not be worth the extra cost. Managed hosts like WP Engine offer comprehensive security features. There are a multitude of threats that can bring down a WordPress site. From DDoS attacks to viruses and malware, you need to ensure your site is protected across the board. 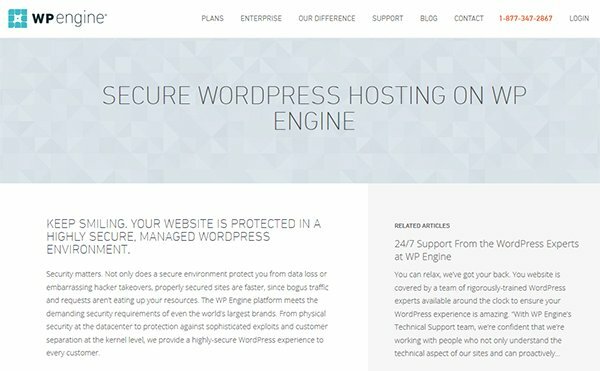 A popular attraction for managed WordPress hosting is enhanced security. Most providers promise a level of protection that the users will struggle to match on their own. These features include regular scans on the server level for malware and potential threats. Each host also offers specific features that further secure your WordPress install. DreamHost, for instance, offers an isolated MySQL database on a virtual private server, where it cannot be tampered with. If your site does suffer from an attack, a managed host can quickly fix the problem and restore your site through a backup. There are benefits and drawbacks to this approach. Regular scans, a secure server, and the attention of a dedicated staff are definite advantages. However, a managed host means you may have less control over your WordPress website. You will be unable, in many cases, to make certain changes to your site files, themes, or plugins. This is often the case for hosts that handle the WordPress install and maintenance themselves such as WP Engine, though the restrictions in place are clearly explained and eminently sensible. A survey of basic shared hosting plans shows that very few offer any kind of extra protection at all (see list below for more details). At best they offer minimal malware scans and removal. So is the added security of a managed WordPress host worth the cost? If you’re concerned about viruses and vulnerabilities, you won’t get better protection than with managed WordPress hosting. This is especially true for larger websites that cannot afford any down-time, or simply want peace of mind. When you factor in the potential cost in terms of both additional man-hours and hassle that a security breach could result in, the added security of managed hosting is a huge plus point. Managed WordPress hosts promise a suite of support tools and features. When you’re running a WordPress site, there is a potentially mind-boggling amount of things you need to keep on top of. It can sometimes feel like a juggling act trying to keep up with the various ongoing innovations in the ecosystem. With managed WordPress hosting, much of this burden is taken off your back. Your host will offer comprehensive support for your WordPress site. This often begins with the install: from setting up the MySQL database to the transfer of WordPress core files. Providers often offer professionally designed themes for your website which help raise its profile. In some cases, they’ll even select the best plugins and tools to keep your site running smoothly (including those social media touches everyone loves). In addition to all this, managed WordPress hosts promise regular updates to WordPress core, frequent backups, and live, hands-on support when you have trouble. For the higher price, they make you feel like a VIP. This kind of attention is like having your own team of WordPress developers at your disposal. The downside is you are often dependent on them to make the most basic changes to your WordPress site. For a technology originally built to be accessible for the user, you may feel locked out of your own website. Deciding to go with managed hosting for the support is a trade-off. It will ultimately depend on how much time versus money you want to spend on your WordPress site. If you are comfortable with working on WordPress, you will save money by avoiding managed hosting. However, time spent tweaking your site can amount to money wasted when you could be relying on a team of dedicated support experts to take care of things for you. Some of the top managed WordPress hosting companies. Below we’ve compiled a list of companies offering managed WordPress hosting including a run-down of their features, pricing, and what kind of customer is right for their services. The grand old man of managed WordPress hosting, WP Engine was one of the first to offer dedicated WordPress features to site owners. In addition to a custom install of WordPress files, they offer attentive customer support, and a tier of hosting packages. Great for large businesses that can afford comprehensive support and do not wish to managed the backend themselves. Pricing: Starting at $29 per month. Professional tier starts at $99 per month. Features: 24/7 Support, Daily Backups, and CDN ready. Security: Multiple firewalls, malware scan, 1-Click Backups and other security features. Unique Features: Evercache, their proprietary caching technology. Best for: large businesses or rapidly growing websites. Flywheel is another host that focuses exclusively on WordPress solutions. They specialize in providing support for designers and creative agencies, customers with front end skills but who lack coding or technical expertise. They offer scaling features which are ideal for customers who want to start small and grow over time. Their pricing structure is simple, focusing on fewer plans with more options. Flywheel also offer an excellent set of resources for WordPress site owners which are worth a look whether you choose their services or not. Pricing: Starting at $15/mo for basic features. Features: Built-in caching, auto-backups, managed WP updates and a range of further features. Security: Malware monitoring, intelligent IP blocking and other security features. Unique Features: One-click staging, free demo sites, and collaboration tools are all available. 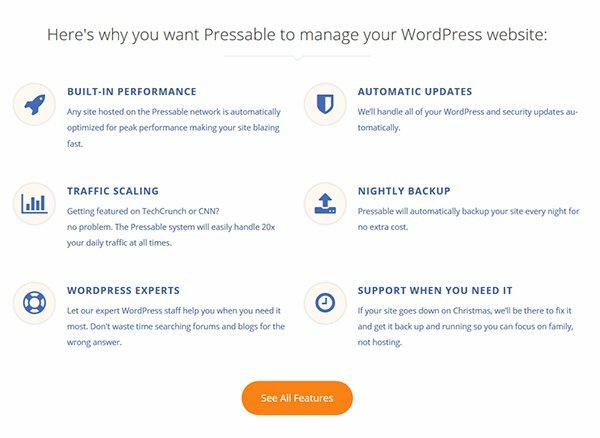 Quickly growing in popularity, Pressable market themselves as “Rated #1 in customer satisfaction” and offer many of the standard managed WordPress hosting features such as live support and improved performance. In addition, they offer specific tools aimed at different clients such as freelancers, marketing teams and even government agencies. Their standard price plan provides support for five sites while their highest package goes up to 20. Features: Auto updates, traffic scaling, nightly backups are all available. Security: Intrusion detection and malware scanning come as standard. Media Temple boasts that its plans are “made by WordPress designers and developers, for WordPress designers and developers.” They offer a variety of scaled plans from individuals to corporate accounts but focus on their speed and design. Their strong points are the scalability of the packages. A customer can start with a basic package and add on more resources at anytime without changing plans. Features: Quick setup wizard, daily backups, developer tools. Popular companies that offer shared hosting plans. If you decide the suite of features offered by managed hosting isn’t for you, we’ve provided a list of popular shared plans. They offer less advanced features but more affordable packages. Price: Starting at $3.49/mo (regularly $5.99). Final Consensus: Worth It, for the Right Features. After looking over all the features that shared and managed WordPress hosting provide, it’s clear there’s a big difference between the two. For the extra cost, managed WordPress hosting is the right choice for large businesses with growing websites, or users who expect their sites to grow rapidly. The key is in finding the right host, one which focuses on the features that are most important to you (speed, security, or support). If you’re not ready to take on the added cost, or are comfortable managing your own WordPress site, then you should stick with a basic, shared hosting plan for the time being. We hope you found our guide helpful. What kind of hosting do you prefer? Have you chosen managed hosting over shared? What are the extra features you cannot live without? Be sure to let us know in the comments below or ask any questions you might have. Article thumbnail image by Macrovector / Shutterstock.com. Thanks for this article. You teased out important considerations. This. No matter what backend system your clients use, keeping it up-to-date and hosted is necessary. It’s an easy sell if you design their website. I typically build in hosting and some kind of support component for a year after the site is built. It’s not a big money maker but the sites I’ve hosted tend to lead to bigger projects so in a sense it’s a loss leader. If you didn’t design their sites you can sometimes pick up a few clients this way, it lets you both test the waters a bit. If the client is going to be a hand holder, you’ll figure it out quickly and either charge them more or drop ’em. Go Daddy has Managed WordPress Hosting and i love it, better value than most out there. Hostgator now has Managed WordPress Hosting as well. The shared hosting providers you listed I think provide WP hosting, also, but not to the extreme of the others you mentioned. This certainly reinforces a decision I made just a few days ago, when I directed a small business client with roughly 100 visitors a month to shared hosting rather than managed WP. While the security of managed hosting is nice, I couldn’t see any other reason to go with the increased cost. That, and we really wanted CPanel access. Move on to Unmanaged VPS & Server…. Following instructions to set them up and I can’t get PHP to run … (of course we aren’t going to help you as it is unmanaged)… (yes googled tried all possible combinations) Removed Purged & installed the LAMP applications … all postings/blogs/etc say do xy& z and it works BUT no where if xy&z don’t work here is what to do … even though there are a lot of people experiencing the same problem…. The entire thing is a crap shoot … If you get lucky then it is a case of x,y & z and you are off to the races.. If not (and no one seems to know why not!) … well get several large coffees & be willing to spend weeks on a solution…. My experience with many client sites over the last year is that managed WordPress hosting provides a very significant speed/page load performance boost. I don’t know where or when the page load testing was done that you referenced, but I think it’s quite unrealistic to expect a WordPress site on shared hosting to have page loads in the order of 1.5 seconds. I find in my experience that page load times are generally between 2 to 5 seconds. And more complicated sites perhaps with a lot of graphics on the page may be up to 5 to 9 seconds to load a page. This is even with caching plug-ins and some optimization of the photographs to try and make the page load faster. I recently inherited a site where the client had a very complicated WordPress set up with lots of images and plug-ins and were hosted on shared hosting at Media Temple, which is a high-end shared hosting provider. The site was very slow and the client was concerned about this and was looking for optimization. Page should times were running up to nine seconds to load a page both homepage and interior pages. I made a copy of the site on Gdaddy’s new managed WordPress hosting plan, turned off all of the caching plug-ins, and the page load times went from about 9 seconds a page, down to about 3 to 4 seconds a page with no additional optimization at the account level. There are things that the managed WordPress hosting providers can do at the server architecture level that are just not available when trying to optimize at the account level. I’ve had client sites and WP engine for about three years, but in the last year have been putting almost all my new clients on Godaddy’s managed WordPress hosting plans . I find the service and performance is about 90% of what I get at WPengine and currently the Godaddy managed WordPress hosting is on sale for the first year for $1/month. At that price with the security, convenience, and performance of managed WordPress hosting, it’s a no-brainer to put my client sites on that hosting plan. We used to use GoDaddy WP hosting, but it’s not even in the same league as WPEngine (what we have used for a few years). WPEnine’s support, security, speed and built in tools have made my webdev company a lot easier to manage. Shared hosting? Really?? I don’t think so. Not sure why you feel that way. Shared hosting is the right solution for many types of sites. In fact, probably most. That’s why it’s a wildly popular service offering from many large vendors. Quality shared hosting vendors do a good job these days on security and performance. The platforms and data center operations have matured to the point where stability and good performance are the norm. Are there lousy providers out there? Sure. But there are lots of good choices. Dedicated, VPS, and specialized hosting all have their place. I tried and left WPEngine for various reasons and am now quite happy with TrafficPlanetHosting. Their support is the best I’ve seen for WordPress. I use Flywheel. The one-click staging feature alone makes it worth the few extra bucks a month. Not having to think about backups or security are an added bonus. What about SiteGround’s GoGeek (managed WP) Plan? For anyone who has used this plan, can you share your thoughts on whether this is a good managed WP option? I use SiteGround exclusively now and don’t believe you can do wrong with any of their plans, but GoGeek is an upgraded version of their Shared hosting, not really a managed hosting. But as the article infers, it may be all you need. It’s curious that you left off the original WordPress managed hosting platform, WordPress.com. With all their commercial accounts, I’d think they were a pretty important service. The article does not mention the health of the IP ranges or the mail service available. I have also seen sites on many of the providers you mention have horrible load times. There’s a new and pretty unique player in this space, Pantheon.io. (I don’t work for them). They have an amazing dev/staging workflow that includes both SFTP and git. I was amazed with the speed not only of setup, but of page load once the dev site was established. You even get to try them free until you’re ready to link the site to a domain, as you approach going live. You talked about having functionality being taken out of one’s hands by managed WP hosting. Well, this company gives you great control of staging and going live, without limitations on plugins. The UI is smart and the separation of core updates from content updates makes a lot of sense. It’s definitely a more geek-oriented offering, but thoroughly usable by designers. Another option I’ve tried is Digital Ocean, but there you have to do all the work yourself, even building the server. Luckily, their tutorials and community are great resources to lead you step by step through the process of server and WP installation. I have had some issues with WP here – mostly database issues. Thanks for an informative and to the point article. Having launched our online magazine in May, we’re already feeling the need for more security – advertisers require it – and occasional support on the tech side – no time to get specialized in everything, so we’ll probably go with managed WordPress hosting. Any one that you know specializes in publications ? Good article. Last week, we chose for a client site Flywheel over all mentioned + Site Ground a credible option. Flywheel gave Incredible personal support for migrating their site from media temple. Fast, professional & accurate. All done for us –probably saved us hours in work & worry. Yes wp managed hosting Is a few dollars more a month. What flywheel saves us by knocking down the “to do” list Is well worth It. Media temple Is owned by go daddy. We would not trust Go Daddy with anything for us or clients. Thx again for the article. I tried Pressable out a year or two ago, shortly after they changed their name from ZippyKid (or whatever) and they were horrible! When working on the back end of my site(s), I would sometimes have to wait for close to a minute for a page to save or refresh. There was also an incredible amount of down time. After about 4 or 5 months of putting up with them, I decided to give SiteGround a try. Although I’m a beginner developer, I went ahead with their GoGeek plan because I wanted to make sure that I got enough speed and I was not disappointed. I just renewed with them a couple of months ago and, although it hurt a bit to not get the 50% discount that everyone gets in their first year, I still consider them to be, by far, the best value for my relatively lightweight web sites. It’s been more than a year since I left Pressable and, although I cannot recall seeing any significant downtime with SiteGround the whole time, I still get fairly regular email alerts from Pressable that, once again, their servers are experiencing problems. (They didn’t bother to remove me from their auto-email list.) Therefore, I can only say that, in my opinion, Pressable is vastly over-rated and not worth wasting your time on. On the other hand, SiteGround is wonderful for lightweight “developers” like myself. I’ve been using Site5 for a couple years now for my WordPress sites. I was completely new to managing my own sites, and their support has been great. I’m also quite happy with them for performance and price. I was thinking of using insty.me and surprised that it wasn’t mentioned here. It is a hard decision when starting out. My priority is to get as much help as possible to launch my site. I don’t want to spend time fumbling about setting up and trying to learn the ropes. So a managed platform will be suitable but I’d need the flexibility to make changes. It’s curious that Dreamhost is used as an example first of high pricing hosting then provide a group of other hosting companies with sharing options to look at, ET uses Hostgater. A quick check of theses hosting companies reveals many involve themselves with or are from other countries. I’ve been with Dreamhost for over five years and never had any issues that wasn’t solved. Not only do they host for US government sites but offer FREE hosting to non-profit organizational sites. Please stay unbiased and objective. No Pagely? We moved from WPEngine to Pagely for the simple fact of cost – very similar services for a much lower price. Pagely was one of the first (if not first) managed WordPress hosts. I’m fairly certain they started before WP Engine… in a neat little article like this though, there really isn’t room to adequately cover the subject. No mention of Pagely and Kinsta, that’s weird. Both of them have the best performance according to the latest benchmarks. Pressable was not interested in being tested in this round, you can guess why. I think it’s worth pointing out that most managed hosting plans have a blacklist of plugins that they won’t let you run. 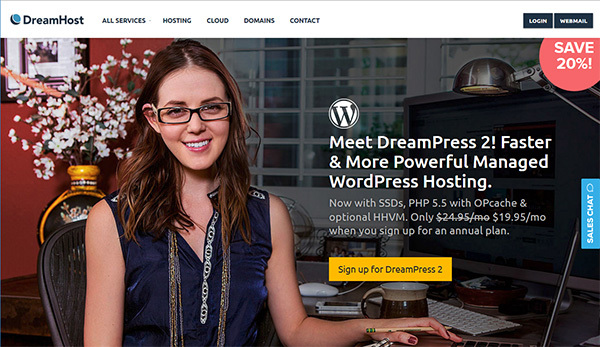 A notable exception is DreamHost’s DreamPress service, which has no restrictions. I did a lot of research before choosing Traffic Planet Hosting. Speed is excellent and support lightning fast. I’ve tried several managed WP hosting providers but I was curious and moved to fully managed VPS hosting at RoseHosting. Must confess, the price is much lower for fully managed VPS hosting and the features are much better. Because of the way my business unfolded over more than a decade, I provide both WordPress development and managed hosting services, on servers I manage. Many of my clients want the entire setup, including the domain name, hosting, email, and the site development, completely outsourced to one vendor. I offer them a one-stop shop. Sometimes I recommend a third party hosting service, either vanilla shared hosting or WordPress specialized hosting. No one solution fits every situation. Recently did a Divi site for a client who insisted he wanted a VPS from a major provider, even though shared hosting was all he really needed. It was pretty easy to accommodate, setting up a VPS and configuring WHM/cPanel, using Liquidweb’s Storm VPS, in that particular case. It’s a bit pricey, but if a client wants that, Liquidweb does a great job on quality of service and support. The only place I won’t let my clients host is Yahoo. They have the worst WordPress hosting of any large provider. It’s a miserable experience working on a Yahoo hosted WordPress site. Bad performance, balky setups, iffy connections. In fact, for the last three weeks, many Yahoo hosted WordPress sites have been unable to updated WordPress or plugins. This article is a bit confusing … there’s nothing about Mailing services mentioned, which is a part of hosting that should be considered. Shared hosting? i dont know why anyone would need that. and some of the mentioned hosting providers already have managed WP as well,.. Thank you for your post. Prefer to have a hosted site where I pay monthly and still own the content I write. It seems that everyone I call wants a fee to create the site and then ridiculous prices to manage it each month. (up to $200 per month) If you decide to change hosts then you lose your entire site. It feels more to me like I am renting a wordpress site rather than owning it. Do any of the above help you set up an existing theme and allow you to host it wherever you want? Great article! I’ve looked very carefully at WP managed hosting to supplement the security and update management services I offer and have never found one that was worth the higher cost and/or the added restrictions. The bulk of the benefits are just as good if pieced together from separate, reliable sources. Does anyone have recommendations for Australian based managed WP hosting? Would love to use a provider that is located a bit closer. The exchange rate and help availability are contributing factors to looking for a locally based provider. elegantthemes.com is a wonderful website for CMS themes. And truly perform services very well. Every theme is every useful and reliable but cost is too much. Some high rating and free WordPress themes alichowdhary.com playing services very well as well. Could you share more of your experience with the security features of the different providers? How good are they at preventing infections/attacks? Their efficiency at response and restoration? “From DDoS attacks to viruses and malware, you need to ensure your site is protected across the board.” -> I think this is a joke considering that most of the hosting mentioned don’t protect you against them. I won’t even mentioned the last recent events which illustrate what I’m saying. Most managed hosting don’t offer DDOS protection nor have a AWF to filter the traffic. WAF and not AWF, sorry for the typo.